The real world globe is impressive and unique in several respects. 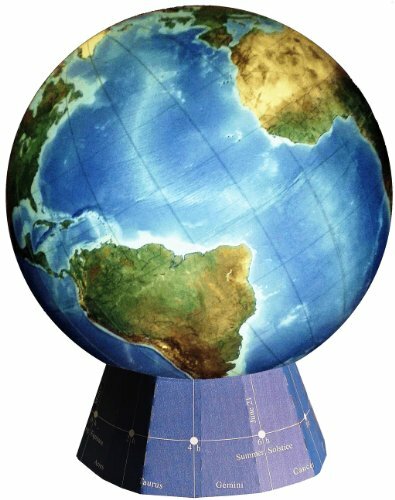 The large 18″ diameter globe features actual satellite imagery of the earth for realistic representation of the landmass, as well as bathymetric (i.e., sea floor) data in ocean basins. This real-world data, together with a dry erase surface, supports customizable and recurring dynamic earth instruction. Experience the Real World, see the earth as it really exists, based on satellite imagery and other primary digital earth data. The rich detail of the earth maps brings to life mountain ranges and other topography, together with ecological biomes and land cover characteristics in striking display. Macro-geography such as mountain ranges, ocean basin topography and abduction/subduction zones form the foundation of plate tectonics and other dynamic earth processes instruction. Contained in the accompanying lesson plans, many earth science concepts are addressed in support of K-12 and college curriculum for earth science. Satellite imagery is enhanced with rivers and hydrology, coastlines, and country boundaries as thin graphics, so as not to distract the eye and study of continuous physiographic information of the earth. Spatial and visual learning systems support lessons addressing: Dynamic earth processes, energy in the earth system, climate and weather, environmental studies, physiography, macro-geology, meridians and parallels, map projections and coordinate systems, principles of photogrammetry and mapping, navigation, spherical geometry and trigonometry, physical geography, cultural geography, history, political science. Dry-Erase Surface to support lessons and hands-on learning.